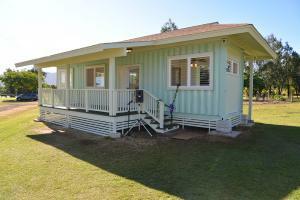 Container home built by Kaua‘i Community College students and faculty. What was once used to carry goods is now going to be used for a good living. Kaua‘i Community College held a blessing and opening of its student-driven Container Home Project Jan. 31, according to the University of Hawai‘i. The Rev. Wayne Vidinha, Sr. of Ke Akua Mana Church conducted the blessing. The project is part of the college’s Ho‘ouluwehi: Sustainable Living Institute on Kaua‘i, and was designed to provide students a broad range of experience in constructing sustainable housing. Carpentry, Electrical Installation, Welding, and Facilities Engineering students received hands-on field experience throughout the project. Mayor Bernard Carvalho Jr., The Rev. Wayne Vidinha and KCC Chancellor Helen Cox with students and faculty. The prototype home, built from a shipping container, is an alternative sustainable living dwelling model for Kauaians. The college’s goals are to prepare students to enter jobs that employ sustainable living solutions in building and to use the prototype home to advance a sustainable living lifestyle on Kaua‘i, and throughout the world. Materials used to build the home were reused and repurposed. Natural airflow keeps the home well ventilated and cool. Space and size reduced the home’s footprint and amount of land used, while maintaining a comfortable place to live. A porch provides additional living space, where homeowners can enjoy fresh air and sunshine. KCC Chancellor Helen Cox said the prototype home is one example of how the college is responding to the growing emphasis on the need for sustainable living practices. KCC offers a Certificate of Completion to students who complete the electric vehicle hybrid course. Its new Sustainable Science Certificate, being offered in the Science and Math Division, has been endorsed by businesses on island for providing important skills related to food, waste, water, construction and energy. 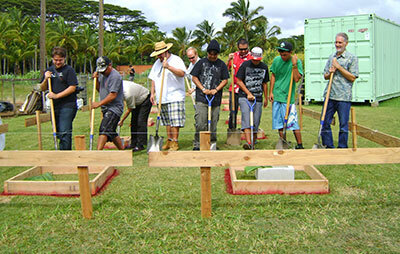 In September 2012, Kauaʻi Community College faculty, staff and students were joined by community partners to break ground for the college’s affordable housing prototype project. The finished project received a blessing last week. Campus projects include an aquaponics system; apiary; an aeroponics system managed by the Culinary Program; growing ulu in partnership with the National Tropical Botanical Garden; assisting the Grand Hyatt Kaua‘i Resort and Spa in constructing a hydroponics garden; and conducting research on beach erosion. An exciting, unique cross-discipline approach to learning places the college’s Electronics Technology students along with an eager high-school student from Kaua‘i High School in the apiary, where they are running experiments to determine a way to deter the small-hive beetle from entry into beehives. Using the electromagnetic spectrum of light from invisible UV to levels of visible to infrared light, their goal is to identify the frequency of light needed to deter the beetles. Their work holds promise of becoming a simple and readily available method of environmentally friendly pest control. For those looking more intently at climate change, where research has been determining that changes are taking place now and at an alarmingly fast rate, the college is preparing students professionally and personally for what’s ahead.